Super Savings Item! Save 33% on the Digital Min Max Thermometer by Outdoor Home. Perfect for Garden, Patio or Greenhouse. Accurate Weather Thermometer with Current Temp & Auto Sensor for Min Max Readings Use Indoors Or Outdoors. by OutdoorHome at List It Fort Lauderdale. MPN: OHTMM6X3. Hurry! Limited time offer. Offer valid only while supplies last.  IDEAL GARDEN, GROW ROOM OR GREENHOUSE MAX/MIN THERMOMETERS: Functional and decorative for the verandah or in your greenhouse, shed or wherever you need to see the temperature. A popular GIFT idea!!  CLEAR EASY TO READ WEATHER THERMOMETER showing the current temperature and the latest min/max temperatures in Fahrenheit or Celsius in the surrounding area to the thermometer. ✅ VERSATILE INDOOR OR OUTDOOR DIGITAL THERMOMETER automatically sets the minimum maximum temperatures, or you can easily reset it yourself with the press of a button. Fully portable so you can place it where you need it most.  A RELIABLE WAY TO RECORD DAILY TEMPERATURES manage your greenhouse plants and water usage efficiently. Whether you need to know how cold or warm it gets for your plants, barn animals, RV, cellar etc,. this handy instrument will give you accurate information. It is also fun and educational for the kids! 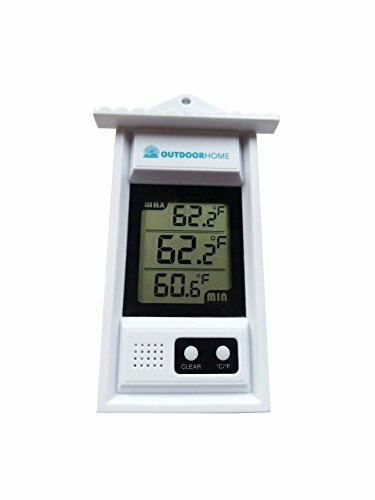  THIS HIGH PRECISION AND HIGH SENSITIVITY INSTRUMENT is easy to use with a weather resistant plastic construction, a clear screen with easy-to-read minmax digital display that ranges between -50 C - 70 C.
If you have any questions about this product by OutdoorHome, contact us by completing and submitting the form below. If you are looking for a specif part number, please include it with your message.